Lobbying by the arms industry is shaping the European Union’s approach to security and 'defence'. The EU’s plans to fund the research and development of new weapons through the European Defence Fund reflects an acceleration in the militarisation of the EU. Information on this page is largely taken from Vredesactie's new report Securing Profits: How the arms lobby is hijacking Europe's defence policy. The combined annual EU lobbying budget of the top ten European arms companies has significantly increased since 2012, from €2.8 million to €5.6 million*. According to data from the Belgian national bank, the arms lobbying organisation ASD has a large organisation budget, which leads campaigners to believe that it may have substantially under-reported its EU lobbying budget. The European Commission proposes to mobilise €40 billion from the EU budget and member state contributions through the European Defence Fund for the research and development of weapons and military equipment. From 2013-2016, the Commission's directorate for Internal Market, Industry, Entrepreneurship and SMEs (DG GROW) had 37 meetings with the arms industry to discuss the Preparatory Action on Defence Research. 2015: European Commission sets up the Group of Personalities on Defence Research - the advisory body to set out the agenda for an EU military research programme. The group was heavily dominated by the arms industry. Its members include the CEOs of arms companies MBDA, Indra, Saab Airbus, BAE Systems, Leonardo S.p.A (formerly Finmeccanica) and the Chair of ASD, the European arms industry lobbying group. The group is chaired by Elżbieta Bieńkowska, Commissioner for Internal Market, Industry, Entrepreneurship and SMEs. According to ALTER-EU research, Elżbieta Bieńkowska, the Commissioner who chairs the Group of Personalities, is the Commissioner with the highest proportion of lobby meetings with corporate interests (86.9 per cent). Although as Commissioner for Internal Market and Industry she could be expected to have some contact with business, no Commissioner should listen so exclusively to the corporate sector. When the European Defence Fund was announced, Bieńkowska immediately tweeted: “Good news for defence industry: new European Defence Fund before the end of the year”. The aim of the fund is clear: sustaining the competitiveness of the arms industry. October 2016: European Parliament voted in favour of the Preparatory Action on Defence Research fund which was proposed by the Commission in the 2017 EU budget. The fund grants €90 million for defence research over a period of three years. November 2016: The European Commission presented the European Defence Action Plan in which it proposed the establishment of a European Defence Fund for the joint development and acquisition of military equipment. It contains a list of proposals to mainstream the military sector into the main EU policies and funds (from research to regional and structural funds, the European Investment Bank, and even Erasmus+). Many of the policy proposals in the Defence Action Plan closely matched proposals made by the arms industry. The Pilot Project and the Preparatory Action on Defence Research (PADR) are the first programmes which are already being implemented as part of the European Defence Fund. Both are military research programmes. The Preparatory Action on Defence Research serves as a precursor to a European Defence Research Programme (EDRP) starting from 2021 and lasting till 2027. The EDRP, which would encompass €3.5 billion, still has to be approved by the European Parliament. In June 2017, the Commission also proposed a European Defence Industrial Development Programme (EDIDP), which still has to be approved by the Parliament and the Council of the European Union. The EDIDP is aimed at the development of new cooperative weapon programmes and the procurement of these weapons by Member States. Contrary to the military research programmes, the EDIDP would mainly be financed by EU member states. Again the Commission wants to launch a smaller version of the EDIDP for 2019-2020, encompassing €500 million in EU funds and €2 billion in member state contributions. For 2021-2027 the aim is to have a fully fledged EDIDP of €5 billion a year, of which €1 billion would be EU funds. June 2017: The European Council welcomed the Commission's communication on a European Defence Fund. It also called for rapid agreement on the proposal for the EDIDP which would divert €500 million of the EU budget over 2019-2020, in order to fund the development of new military technology. While [the European Defence Fund] will not and cannot replace Member States' budgets on defence, it will create incentives for them to cooperate on joint research, development and acquisition of defence equipment and technology. November 2017: 23 European member states took the first formal step to set up PESCO - Permanent Structured Cooperation, for countries committed to spending more on defence and on the procurement of military equipment. A key part of PESCO is setting up the European Defence Fund. By the end of 2017: The Council has to adopt a decision to establish PESCO by qualified majority. [PESCO] foresees the possibility of a number of EU member states working more closely together in the area of security and defence. This permanent framework for defence cooperation will allow those member states willing and able to jointly develop defence capabilities, invest in shared projects, or enhance the operational readiness and contribution of their armed forces. The arms industry exerts its influence in Brussels through a web of direct lobbying, think tanks, events and conferences, and trade associations. All the major arms companies have offices in Brussels, and the AeroSpace and Defence Industries Association (ASD), the arms industry's most important EU lobby organisation, has been pushing for the European Defence Fund. Some proposals made by the European Commission almost mirrored recommendations made by ASD (See ASD's position paper, 'Considerations on the European Commission's Defence Action Plan'). Disclosed EU documents show the decision-making process for the Preparatory Action on Defence Research was heavily dominated by corporate interests. Beginning with the Group of Personalities, which set out the agenda for a EU military research programme, the content of the PADR was almost exclusively decided on by the Commission, the European Defence Agency, member states and the arms industry. Neither civil society nor the European Parliament had any substantive input into this decision-making process. As well as Vredesactie and the European campaign to stop EU funding for military research, several organisations are tracking and exposing the growing militarisation of the EU. CEO's research on the European Commission's advisory groups exposed how a group that is influential in shaping EU security policy (the Protection and Security Advisory Group (PASAG)), has been mired in scandal: last year an Investigate Europe study showed that many of its members – responsible for deciding where EU funding went – had close links to the defence industry. Border Wars, a report by Stop Wapenhandel and the Transnational Institute, looks at the military and security companies that have benefitted from the refugee crisis, and in particular from the EU’s investment in ‘securing’ its borders. These are the companies that provide the equipment to border guards, the surveillance technology to monitor frontiers, and the IT infrastructure to track population movements. The report exposes how these companies both influence and benefit from European policies and what funding they receive from taxpayers. The report shows that far from being passive beneficiaries of EU funding, these corporations are actively encouraging a growing securitisation of Europe’s borders, and are willing to provide ever more draconian technologies to do this. 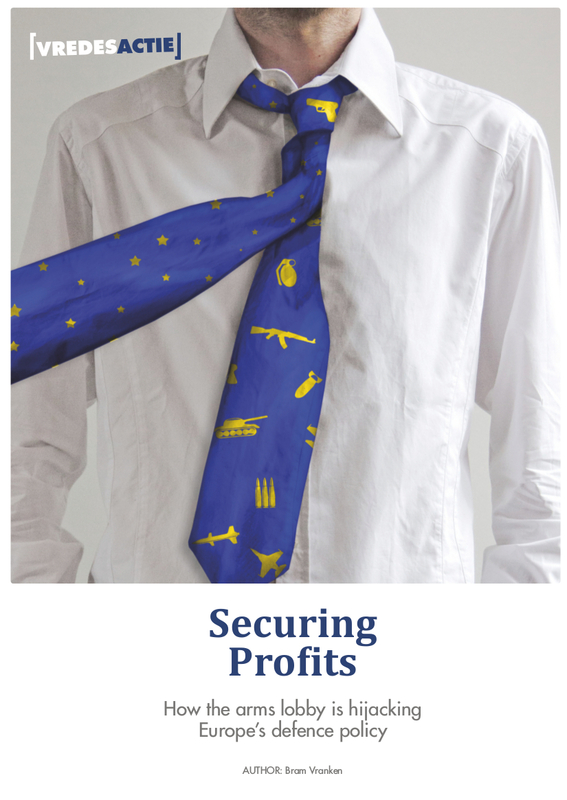 The chapter 'Lobbying for business' (pages 17-24) shows how the arms and security industry helps shape European border security policy through lobbying. 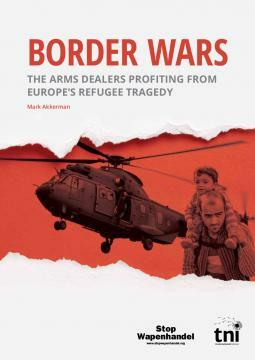 The report was updated with Border Wars II, showing that the European policy response to the refugee tragedy continues to provide a booming border security market for Europe’s arms and security firms, some of whom are involved in selling arms to the Middle East and North Africa and all of whom encourage European policies focusing on stronger borders. 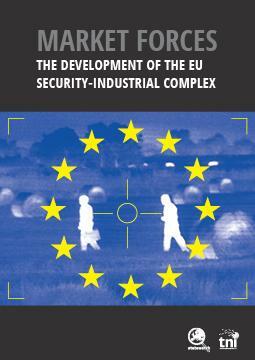 Market Forces: The development of the EU Security-Industrial Complex (Transnational Institute and StateWatch) looks at how EU funding for new security tools and technologies will double in the 2014-20 period compared to the previous six years. The biggest winners have been the “homeland security” industry whose influence on European policy continues to grow, constructing an ever more militarised and security-focused Europe. An infographic on the EU's Security-Industrial Complex explains what is behind Europe's 'Security Union'; who is shaping EU security policy and who is benefiting from it. It also identifies what are the key policies and which EU institutions involved. Corporate Europe Observatory's report Spin doctors to the autocrats: how European PR firms whitewash repressive regimes sheds light on how dictators and repressive regimes are paying European PR firms and lobbyists to push their agenda and mask their dire human rights records. Agir Pour la Paix and Vredesactie run lobby tours of the EU quarter in Brussels. Join a tour to find out more about the arms industry lobby in Brussels. European Network Against Arms Trade (ENAAT) is a network of organisations and groups campaigning against the arms trade in Europe. Its website has lots of information about the EU and the arms trade, including a data browser. To investigate corporate lobbying of specific companies or trade associations in the EU, you can use the lobbyfacts.eu website and our research toolbox. Follow 'I Stop the Arms Trade' campaign on Facebook and #NoEUMoney4Arms on Twitter.